Search engine optimisation (SEO) is a difficult thing to get right, but once you do it can have amazing benefits. Achieving a high position in the search engines is one of the best ways to attract new customers, so the quality of your website is really important. To some, SEO is seen as a ‘dark art’ and there are many companies out there who take advantage of website owners by blinding them with science. We, on the other hand, keep things simple and just tell you how it is. We ignore all the SEO ‘myths’ you hear about and just focus on the facts. Search engines such as Google, Bing and Yahoo set their own rules, so it is important for web designers and developers to keep up with the latest from the big search engines. Again, you can count on us to do that. SEO is the practise of ensuring that your website is put together in a way that is appealing to search engines. 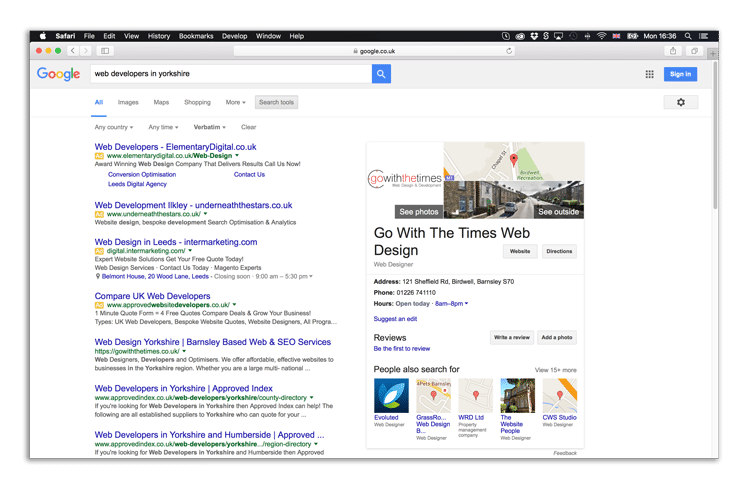 Search engines such as Google issues guidelines to website owners (webmasters) to help them ‘optimise’ their website in a way that makes Google want to rank it more prominently in search results. Google’s aim is to offer it’s users the best possible search experience. When a user performs a search, Google needs to ensure that it returns the most relevant and useful search results it possibly can. If it didn’t do this, people wouldn’t use it, so Google as a business would suffer. Google therefore puts ‘rules’ in place for websites, to ensure that it only returns good quality search results for it’s users. These ‘rules’ are what web developers are encouraged to adhere to when building a website, and this is where we start getting into optimisation. Google calculates it’s search result output using an ‘algorithm’ which takes all the elements that Google considers ‘good’ and ‘bad’ on a website, then calculates where that web page should appear in search results.